Tender Rose provides one-on-one memory care in homes and facilities for people living with Alzheimer’s disease and other forms of dementia. We use a person-centered activity-based approach to dementia care and helping our clients with the activities of daily living. Our Care in Full Bloom philosophy takes the “whole person” into account, weaving his likes, dislikes and interests into his daily care. Which Services are Right for My Loved One? 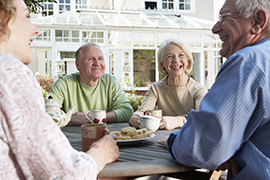 Services for Senior Care Facilities: For residents of senior care facilities who need additional care.